The Imamate of Oman is a fairly powerful nation in the Middle East, covering the southern end of the Arabian Peninsula. It is the largest nation in the Islamic world to have a majority population of Ibadi Muslims, a form of Islam distinct from Shi'a Islam and the 'Orthodox' schools of Sunnism. Ibadhism is known for its 'moderate conservatism', and also for its choice of ruler by communal consensus and consent. In Ibadism, power is vested power in the Imam, the leader nominated by the ulema, the educated class of Muslim scholars who perform the interpretation and maintenance of Islamic law in society, as well as mediating disputes. The selected Imam must then gain the allegiance of the tribal sheikhs of Oman, before also receiving the bay'ah (oath of allegiance) from the general population. Only then is the Imam confirmed in their position. If they fail at any stage then a new Imam must be selected. This sometimes leads to periods of political deadlock as Imam after Imam is rejected at one stage or another of the selection process. Oman is a centre of trade, particularly between India and Europe, with one of the largest stock exchanges in the world. It also profits greatly from travellers on the Hajj to Mecca. Although it suffered economically from the elimination of slavery in 1842 it has since recovered as now remains a major regional power with a significant military and a powerful navy. Among other things the Omani military performed good service with the Indian Alliance during the Long War. There is significant political rivalry between Oman and the Ottoman Empire. The title of the Imam is 'Sultan of Muscat and Oman', reflecting the merging of the two contrasting political cultures of the coast and the interior into the unified whole of the Imamate. Capital of Oman is the city of Muscat. The flag of Oman is a plain scarlet rectangle, the traditional flag of the country. The Ottoman Empire is a militaristic, technocratic Muslim state that controls most of North Africa and the Middle East, as well as Greece and the Southern Balkans in Europe. It does not, however, control Anatolia; this is part of the Holy Russian Empire and has been since it was invaded by the Persian Empire in 1864 and handed to the Holy Russian Empire by the Persians in 1873. In addition to this, the Ottoman Empire controls the Muslim holy city of Mecca, and also the two Suez canals, one completed in 1766 following the route of the ancient canal linking the Nile and the Red Sea, and the other completed in 1852 directly linking the Mediterranean and Red Seas [much as the Suez canal of the real world does]. The Ottoman government is a secular meritocratic technocracy, using the principles of Sophocracy to run the Empire along what its rulers consider to be the best possible lines. It is also a constitutional monarchy, with the Caliph, currently Osman V, performing a largely ceremonial and religious role. Since the Sophocratic revolution of 1888 and the reforms of the political structures of the Empire instituted as part of its aftermath the roles of Caliph and Sultan have been separated, with the Emperor remaining Caliph and the authority of the Sultanate resting with the government as a whole. As another part of the Sophocratic revolution the Janissaries and the Mamluks of Egypt, both of which groups were seen as at least partially responsible for the defeats of the Ottoman Empire against the Russians, were forcibly disbanded, with great loss of life among both groups. Sophocracy as practised in the Ottoman Empire is very much an interpretation of the original writings of Enver Sevket. Despite its ostensibly using Sophocratic principles to run the Empire along the best possible lines, these principles are strongly filtered through the ideology of the government, steering its conclusions and decisions towards supporting the existing form of the Ottoman government. Because of this any criticism and analysis of the government is heavily discouraged, with work and re-education camps for those who offend against these rules being situated deep in the deserts that make up significant parts of the Empire. Knowledge of Islam is also considered a significant factor in the rating of a persons merit, although given the secular nature of the government this is not an overriding factor. Despite its dictatorial nature the Sophocratic Ottoman government does at least adhere to its stated principles of equal opportunity for all, including women, assessing all children throughout their schooling and giving those who shine the best chances to rise, for their own good, and the good of the Empire. All citizens are streamed into their 'scientifically determined' 'ideal role' in their teens, and are expected to stay in that role for the rest of their lives. In addition to this all citizens are required to participate in military service when they reach adulthood, and regularly for the rest of their lives. This is partly for defence against the Holy Russian Empire, but also to protect the Empire against any other threats which may occur. Because the role each person is assigned to is 'scientifically determined' Ottoman society is very hierarchical and there is very little social mobility after a person reaches adulthood. However, because the process used to determine the 'ideal role' for a person is by no means perfect, many people find themselves trapped in jobs that do not suit them, and which they cannot escape. Because of this many citizens are not exactly motivated to give their best. Despite its problems, the Ottoman system is an honest one, at least since the reforms put in place by the Sultan Suleyman IV in 1967 following the discovery of massive levels of corruption within the Empire. Part of these reforms was the establishment of the Office of Impartiality and the Office of Balance, each intended to monitor the state and each other to avoid problems with corruption in the future. The Ottoman Empire is a member of the Sarajevo Pact, and also has close ties with the Mughal Empire, having developed these during the Long War. The official language of the Ottoman Empire is Turkish, although many other languages are spoken among the various ethnic groups within the Ottoman Empire. Ottoman Turkish is divided into three dialects, Kaba Türkçe (Vulgar Turkish), the everyday language used by all citizens of the Empire, Orta Türkçe (Mediocre Turkish), the language of the higher classes and which is also used in trade, and Fasih Türkçe (Eloquent Turkish), the language of poetry and administration. Fasih Türkçe is a version of Turkish which, although the basic grammar remains Turkish, also has a vast addition of Arabic and Persian grammar and vocabulary. This makes Fasih Türkçe a language which is essentially incomprehensible to any Ottoman subject who had not mastered at least two of the three languages that contribute to it. Despite efforts to merge the three version of Turkish, the three varieties of the language are very different, to the point that ordinary people sometimes have to hire special translators and interpreters to be able to communicate with the government. For all of these dialects the Ottoman Empire continues to use Arabic script. Fluency in these languages is a significant part of the Sophocratic testing used to determine the place of a person in society. The basic unit of currency in the Ottoman Empire is the Akçe, a silver coin. Three Akçes are equal to one Para, and one hundred and twenty Akçes makes up one Kurus (also known as the Piastre). The capital city of the Ottoman Empire is Jerusalem, the Empire having been forced to move its capital there from Istanbul after their defeat in the Anatolian War in 1864. 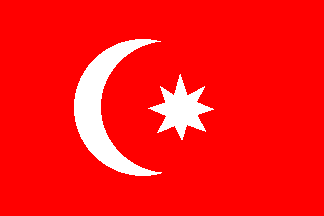 The flag of the Ottoman Empire remains its traditional one of a white crescent moon and star on a red field. The Muslim holy city of Mecca forms a part of the Ottoman Empire. It has long been the destination of millions of Muslim pilgrims every year, especially for the Hajj. Since the Hajj War of 1857 Mecca has had a great deal of investment in facilities and infrastructure, much of it from the Mughal Empire, allowing it to cope with the vast numbers of pilgrims it receives. Much of this has consisted of the construction of numerous 'dormitory cities' around Mecca itself for the pilgrims to stay, the provision transport to and from them from local air and sea ports, and the provision of public transport from them to and from Mecca itself. The dormitory cities, although built simply, have also been built as much as possible to respect the Hajj and those who use them. A largely Islamic state in the Middle East, the Persian Empire prospered under the forced neutrality and its associated lack of a significant military that was imposed on it after the War of Persian Betrayal. This was assisted by the largely hands-off approach to governance taken by the ruling Foroutan dynasty. Unfortunately this and their position between the two main combatants also meant that when the Long War began and both the Indian Alliance and Holy Russian Empire demanded access to their lands, there was little they could do to stop them. Their riches, and their many largely defenceless high-value industries, also made them a prime target. Although they did prove to have more weapons than strictly allowed by their neutrality, during the course of the Long War Persia was fought over, back and forth by both sides, and although they put up rather more of a fight than expected, they were crushed. A large percentage of the population fled in all directions as refugees, in particular into the Ottoman Empire, the Mughal Empire and Oman so that by the end of the Long War the country was largely in ruins, and significantly depopulated. Although the Foroutan Dynasty was restored after the end of the Long War, the Persian military, largely built out of the numerous resistance groups which grew up during the Long War, was dissatisfied with them, and so expelled them in a military coup in 1993, setting up a new government, a military dictatorship, ruled by the Military Council. The Fouroutan Dynasty and old government were purged as enemies of the state during this process. Now the new Military Council, a strongly nationalistic group, works to rebuild Persia and restore it to its 'rightful' place in the world. This rebuilding is being helped by numbers of Persian refugees returning to their now-peaceful homeland. The new government is also building up the Persian armed forces more than would seem to be needed for defence alone, and for this reason, although none of its neighbours have yet intervened in Persia, all have begun keeping a close eye on its activities. The Persian people have more respect and liking for the Mughals than the Russians, despite them both being invaders of their country. This arises from the Mughals much greater respect for their religious sites and beliefs, as well as shared culture and language, as opposed to the Russians who have none of these and who have actively worked to eradicate non-Russian Orthodox religion in all of their conquests. The capital city of Persian is Isfahan. The main unit of currency in Persia is the Abbasi, which divides into two thousand Dinars. A larger unit, the Toman, equivalent to 50 Abbasi, is also used for large sums. 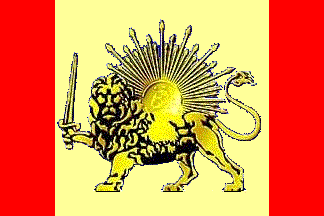 The Persian flag consists of a wide sand-coloured central band on which is a golden lion bearing a sword, the traditional symbol for Persian. A red band runs down each side of the flag.